Shopping for Metal Gear Solid Computer Accessories? Store your digital data like Raiden from Metal Gear Rising: Revengeance! 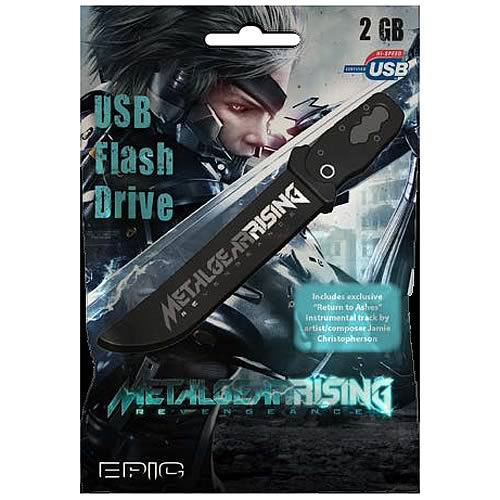 If you're a fan of the Metal Gear Solid video games, this Metal Gear Rising Revengeance Raiden's Sword 2 GB USB Flash Drive is definitely something you should consider. With the capability to hold up to 2 GB of digital information, and shaped in the form of Raiden's sword, it's ideal for transporting your music, photos, and files. It also includes an exclusive "Return to Ashes" instrumental track by artist/composer Jamie Christopherson! Compatible with most Windows, Mac, and Linux operating systems, as well as USB 1.1 and 2.0, the Raiden's Sword Flash Drive measures about 5-inches long.